Prof Christopher Pissarides is the 2010 Nobel laureate for Economics. He was awarded the Sveriges Riksbank Prize in Economic Sciences in Memory of Alfred Nobel for his “analysis of markets with search frictions”, together with Professors Peter Diamond of MIT and Dale Mortensen of Northwestern. He is currently the School Professor of Economics and Political Science at the London School of Economics and Political Science and the Marfin-Laiki Chair in European Studies at the University of Cyprus. Prof Pissarides specializes in the economics of unemployment, labor-market theory, labor-market policy and more recently he has written about growth and structural change. He has written extensively in professional journals and his book Equilibrium Unemployment Theory, now in its second edition, is a standard reference in the economics of unemployment. 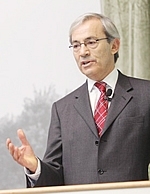 Prof Pissarides was the President of the European Economic Association. He is an elected Fellow of the British Academy, the Econometric Society, the European Economic Association and the Society of Labor Economists. He is serving or has served as a member of Council of the European Economic Association, the Econometric Society and the Royal Economic Society. Outside academia he has served as an external member of the Monetary Policy Committee of the Central Bank of Cyprus from its creation in 2000 to its dissolution in 2007 and on the European Employment Task Force chaired by Wim Kok (2003). He has been a consultant on employment policy and other macroeconomic issues for the World Bank, the European Commission, the Bank of England and the OECD. Other honors include the IZA Prize in Labor Economics (shared with Dale Mortensen in 2005) and the Republic of Cyprus “Aristeion” for the Arts, Literature and Science (2008) and the Grand Cross of Archbishop Makarios, the highest award of the Republic, received in 2011.